DISCLAIMER: I do not recommend doing this hack and I will not take responsibility if someone tries it on their machine. Machine now replaced by an iPad mini. Also looks like my MacBook Pro 13" A1278 got a failed HDD cable. Try replacing the part 821-0814-A and maybe it'll run another day. Moved again. Static HTML awesome. The iBook still in daily use w/o the display. Ha. Moved again. Living in a database now. “ooh, so advanced”. Oops. The document has been offline for a while. The problem renewed and I decided to simply gut the screen. Works perfect for my parents as an email machine. The document moved to a different server. Apple has also recently extended the iBook Logic Board Repair Extension Program to cover more Dual USB models. 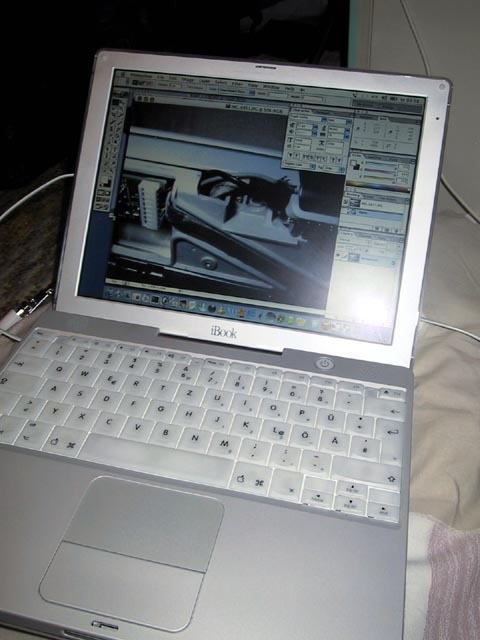 If you’re not covered for one reason or another, see Duncan’s log entry “Successful fix for my iBook’s flickering LCD backlight problem”. Apple today launched iBook Logic Board Repair Extension Program which is related to display related problems. The first few generations of Dual USBs are not covered by the act, though. Serial numbers from UV220XXXXXX to UV318XXXXXX are valid. See the link for details. I’ve had a few mails asking how has the iBook been after I fixed it. I don’t own it any more, but to this day it has been working just fine. No side effects, etc. Just be careful when you put it back together and you’ll be ok. The page moved due to restructuring of my site. The iBook is still alive and kicking. Six months, nae bad. 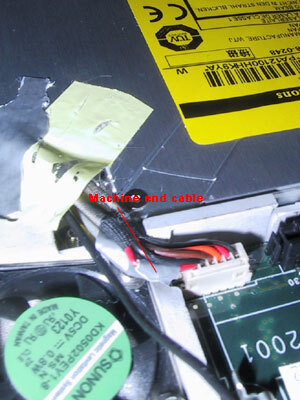 John Heffernan reported that the service manual for Asia contains info on the display disassembly. He reports the site is still up, but many links are dead. The problem with my iBook was that the backlight faded out when I opened the screen too much. The matrix array was working fine, I could see that through the cut apple against a light. Some times the backlight woke up when I sleeped & waked up the machine. I took the machine to repairs, but they insisted on swapping the whole display module. The cost was too much (EUR 1066 vs. a new low end iBook around EUR 1200 :), so I decided to take the machine back as it was. Since the display worked perfectly when I had the machine on my desk I decided to keep it there until I had time to do something about it. Just before christmas I decided to gut the machine.. I printed out the iBook service manual and took the machine apart. The service manual does not have any instructions on opening the display, but it is pretty simple (Just open up the four Allen screws on the sides and snap the cover off). I quickly got through to the problem after unplugging the backlight cable from both the machine and the display module. 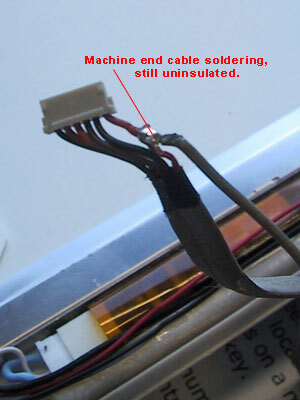 I used a multimeter to find out the red cable carrying a 5 volt signal was damaged. I decided to add a new cable in addition to the existing one. 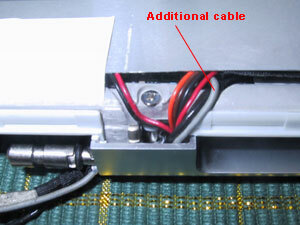 I saw the hinge could take one additional cable through it, so I soldered an extra cable to carry the signal. I put the hinge and the machine together carefully. The extra cable was quite easy to route along with the bunch of cables. I also insulated and shielded it using tape, especially in the areas where it would probably be strained. Now it has been just a few hours since I fixed the machine, but it seems to work fine. Of course, there’s no guarantee how long the fix will last.. 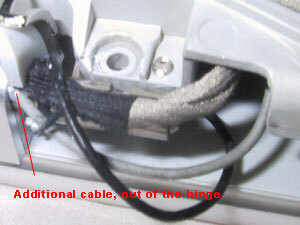 The best option would be to install a replacement cable, but these might be hard to get hold of. Machine end plug, same job needed for display end. …but it’s a little tight when coming out. After… no problem so far.